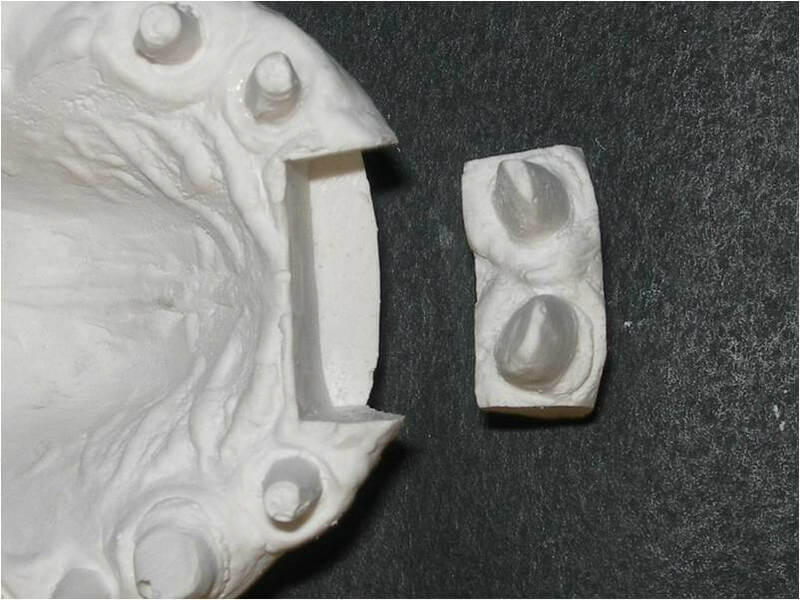 A new technique of prosthetic dental abutment movement with individualized fixed resin provisory crowns and resilient material is proposed. 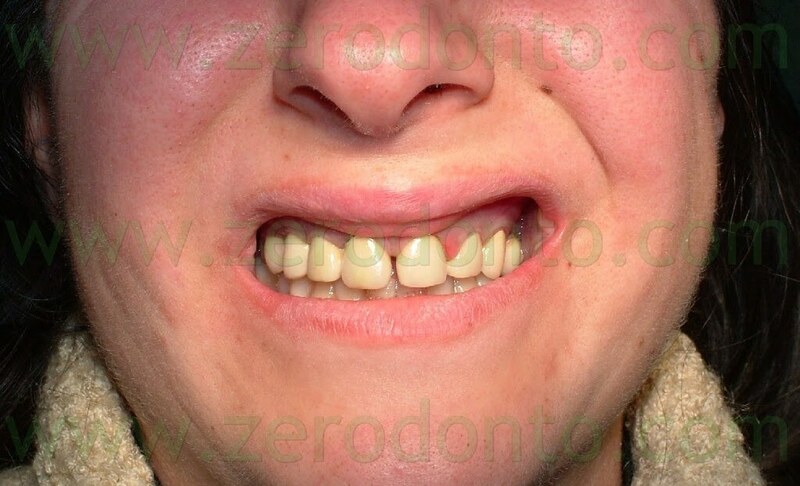 Two clinical cases with 4 years of follow up will be showed. 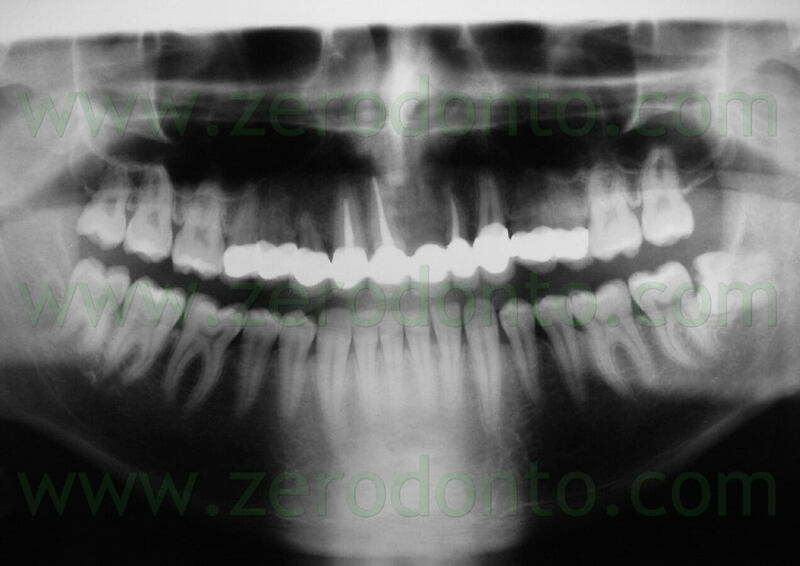 A man 26 years old came to our observation, previously treated in the maxillary arch with an incongruous fixed prosthetic therapy, a full arch, after a traumatic event. 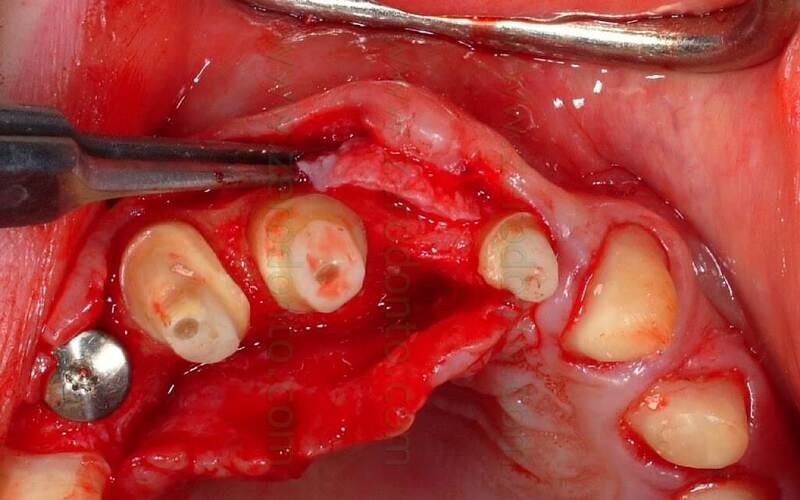 It was necessary the avulsion of tooth 21 and were prepared dental abutments from tooth 15 to tooth 25 to realize the bridge. 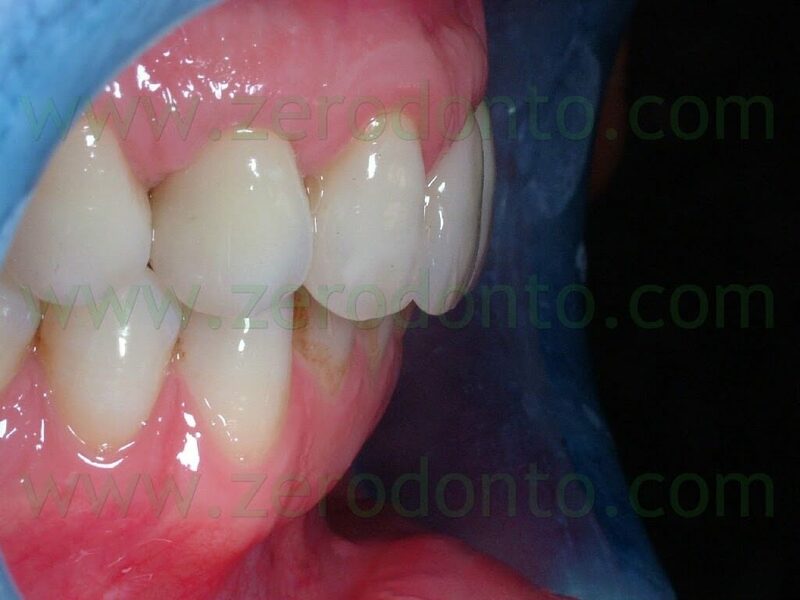 This prosthetic therapy appeared aesthetically incongruous because of the shape and colours aberrations of the crowns. 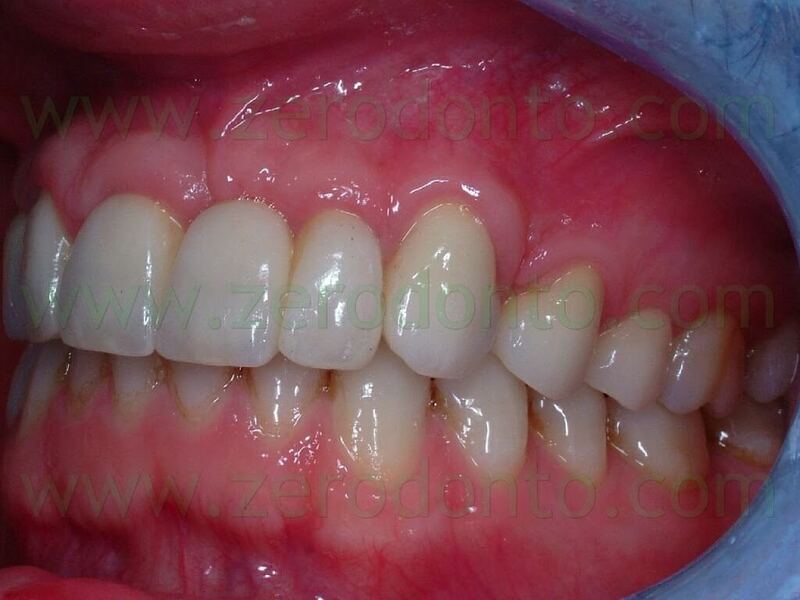 In addition to these aesthetic problems, because of which there was the patient request of a new rehabilitation, it appeared a periodontal suffering with probing depth between 4 and 5 mm. 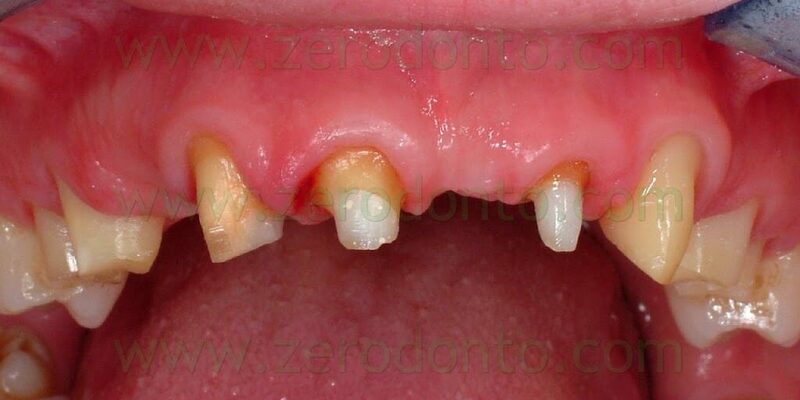 Instead satisfactory and compatible with a good periodontal health were the other teeth conditions. 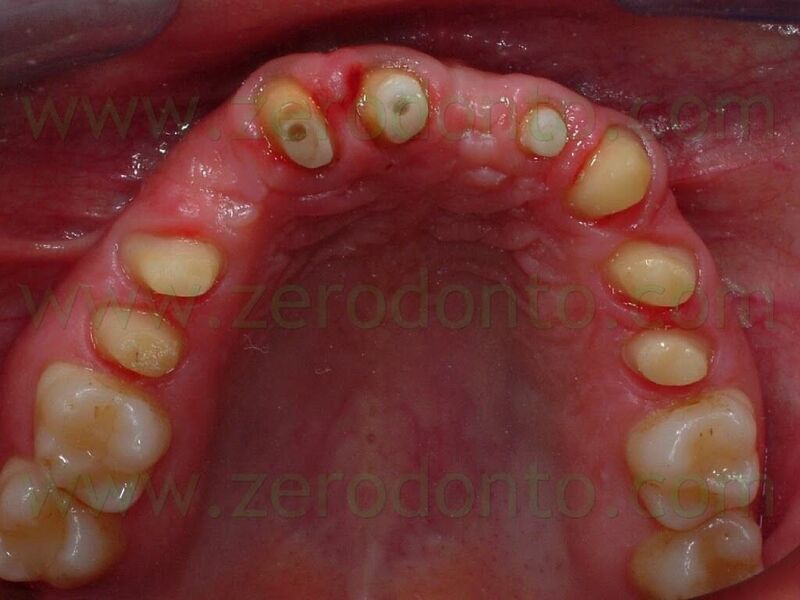 The patient had the tooth 12 agenesis, a tooth 53 persistence and a mesial shift of tooth 13. 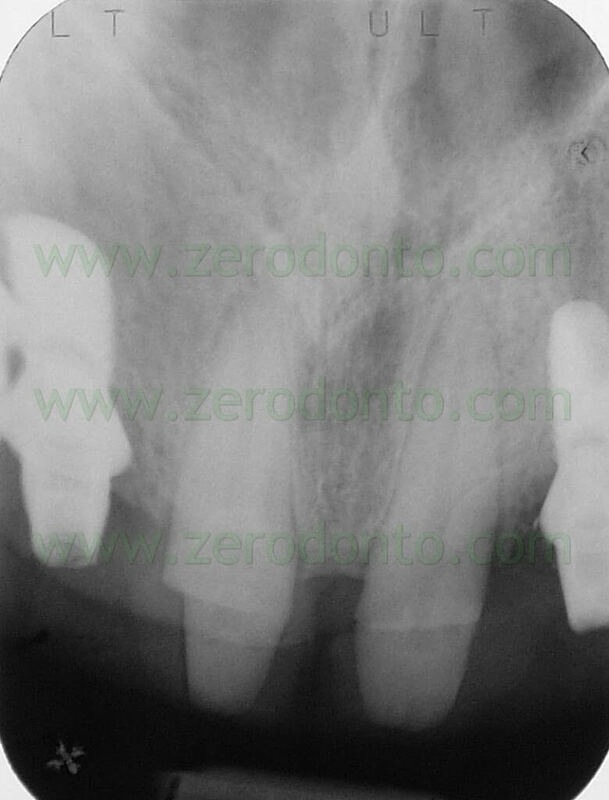 X-rays showed previously incongruous endodontic therapies on teeth 11, 13 e 22 with cronical periapical diseases. 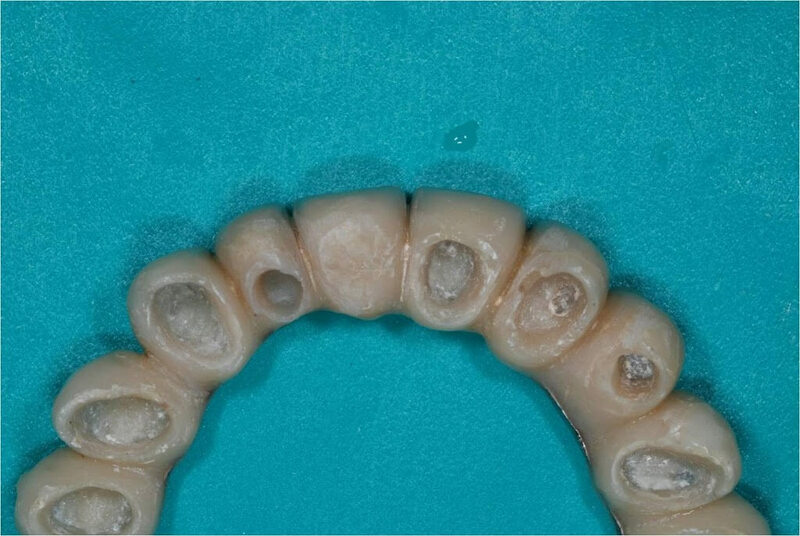 The clinical examination showed also a vertical bone minus of tooth 53 and an advanced root resorption state of this tooth. The patient, adequately informed about the proposed and possible alternative therapies advantages and disadvantages, signed the informed consensus. 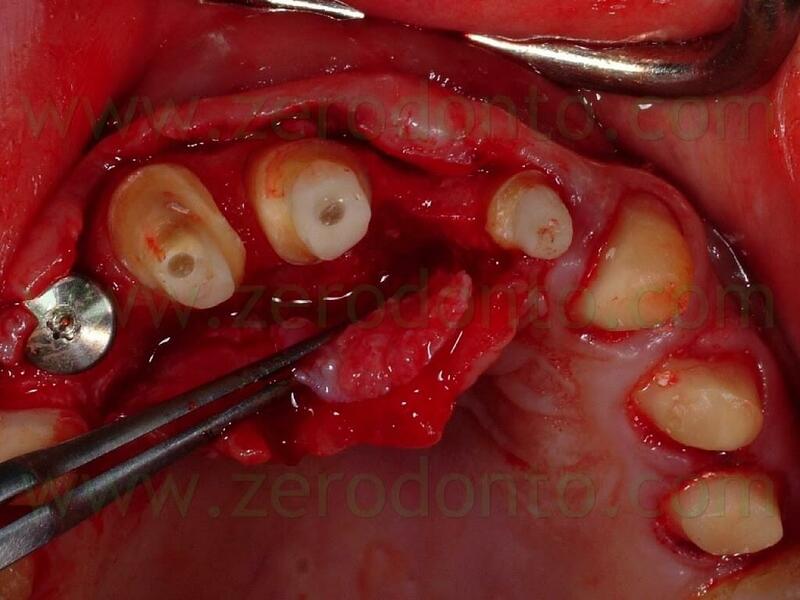 Only the bone regeneration in tooth 21 site and the deferred implant wasn’t accepted. 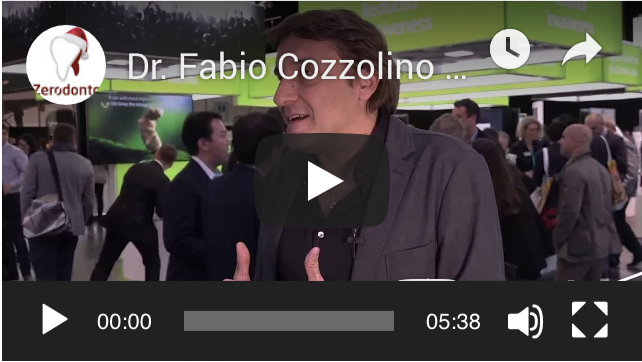 So a connective graft to restore the vestibular convexity in this area was planned. 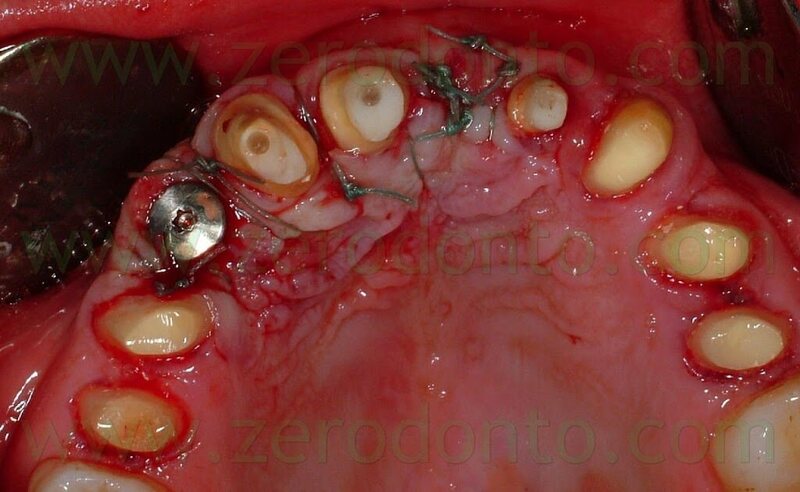 A muco gingival surgery with apical resetting of the flap was done with a paramarginal incision from the mesial surface of tooth 16 to the mesial surface of tooth 26 without relaxing cuts. 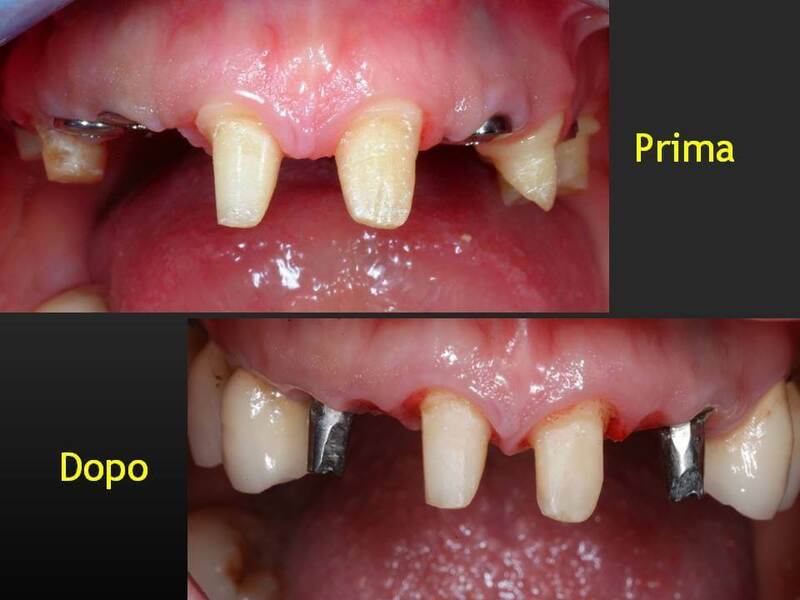 After the dissection of the partial thickness flap were done buccal and lingual retraction sutures to preserve the mucosal flaps from damages and to have a complete and free of interferences view of the operating field. 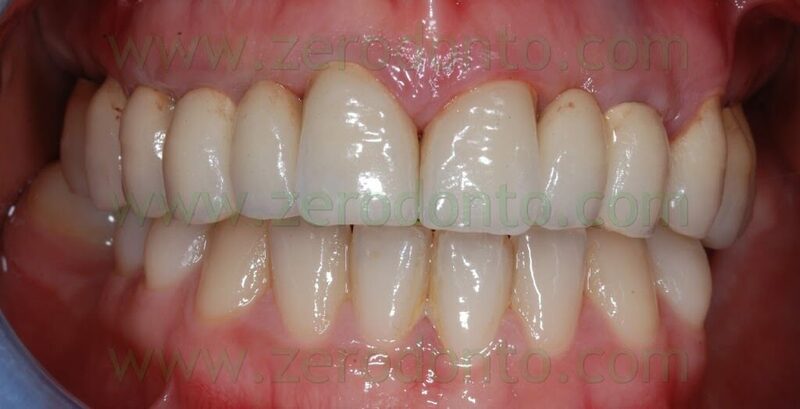 To regularize the scalloped gum was done an osteoplastic on teeth 11, 13, 22, 23. This regularization was accomplished my means of a low speed carbide bur under saline irrigation. For finishing the bone along the root profile, we used a low speed diamond bur to prevent the onset of small notches on the roots caused by the round carbide bur. 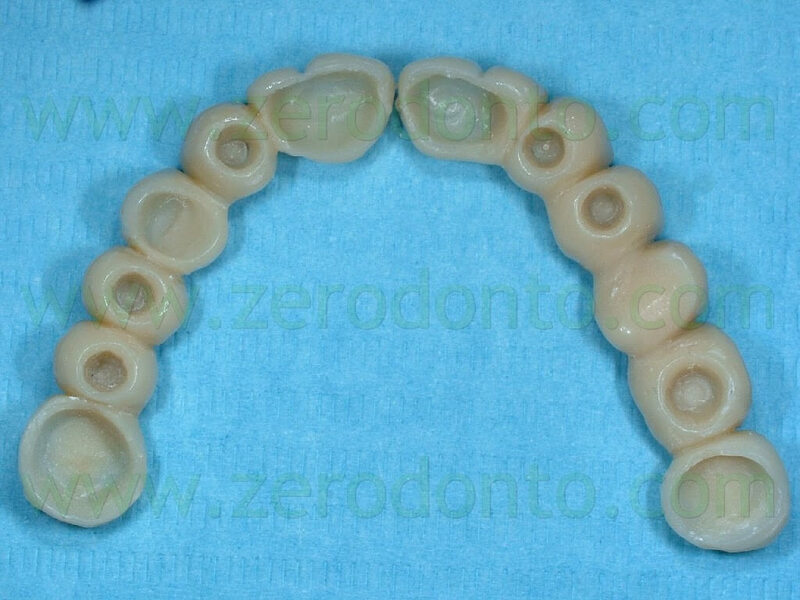 The bone modelling was done with respect to the biological width and the aesthetic parameters described in literature. 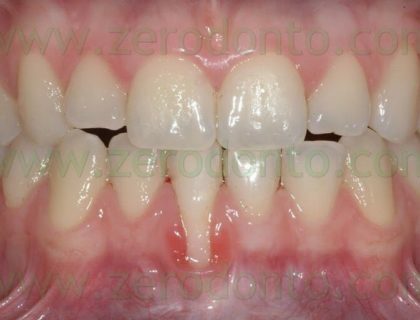 The biological width is the distance between the free gingival margin and the bone crest and in a health periodontum is approximately 3 mm. 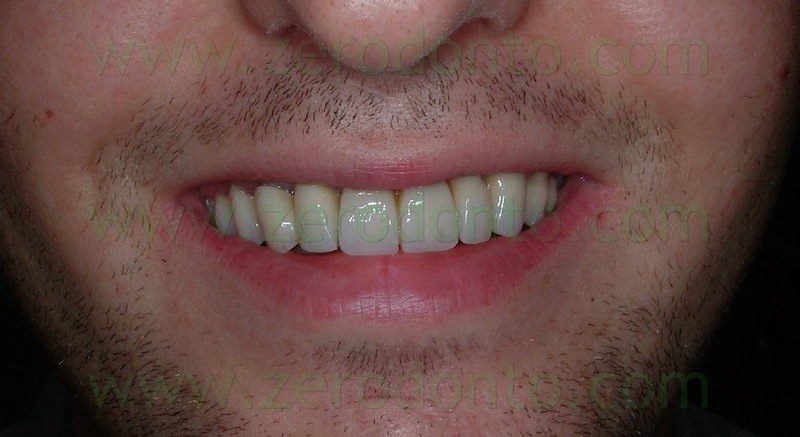 Furthermore, in an harmonious smile, the tangent passing through the zenith of the upper incisors and canines gum parable should be about 1 mm more apical than the free gingival margin of the lateral incisors; during a wide smile, this tangent should be touched by the upper lip vermilion. 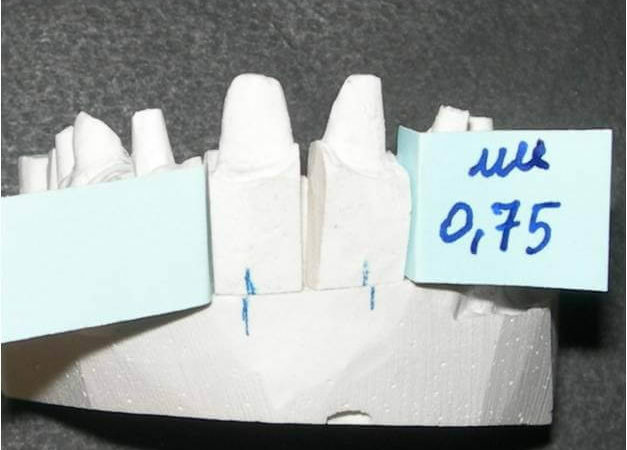 According to these parameters, the dental technician prepared a resin partial fixed provisional, preparing the teeth and modifying the marginal tissues on the working model. 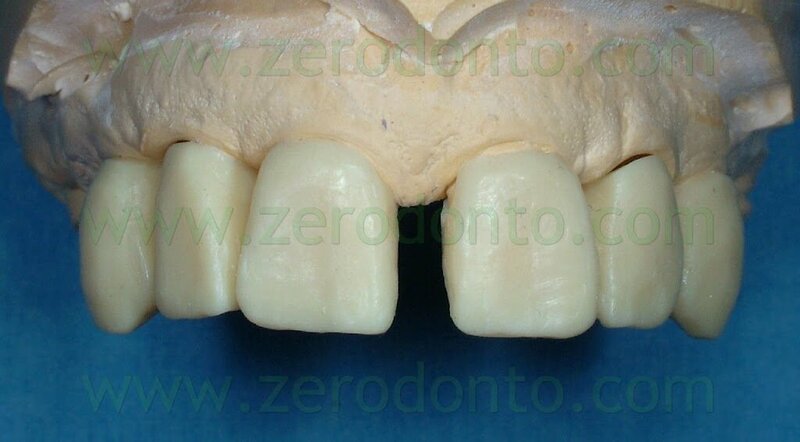 The provisional restoration was used as a template for intraoperative adjustment of the bone. 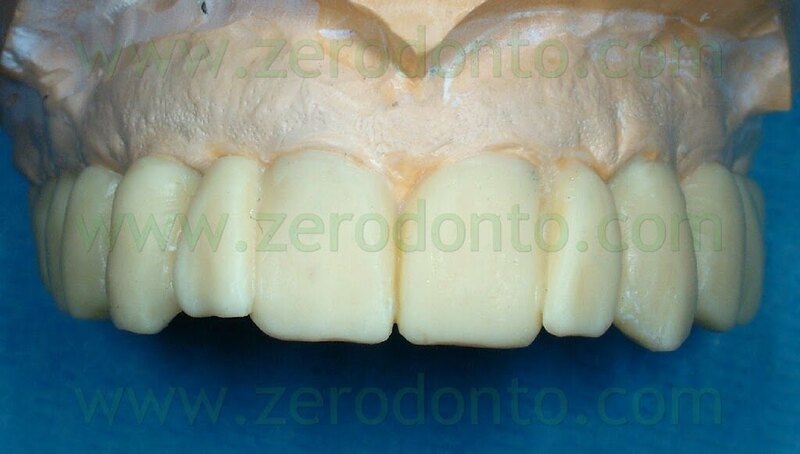 This procedure, therefore, was carried out by placing the bone margin approximately 2 mm apical to the margin of the provisional preparation. 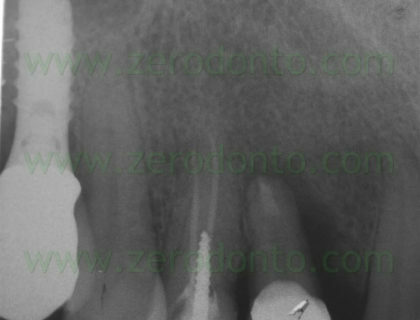 During the mucogingival surgery, tooth 53 was extracted because of severe radicular damage , as showed by X-ray examinations. 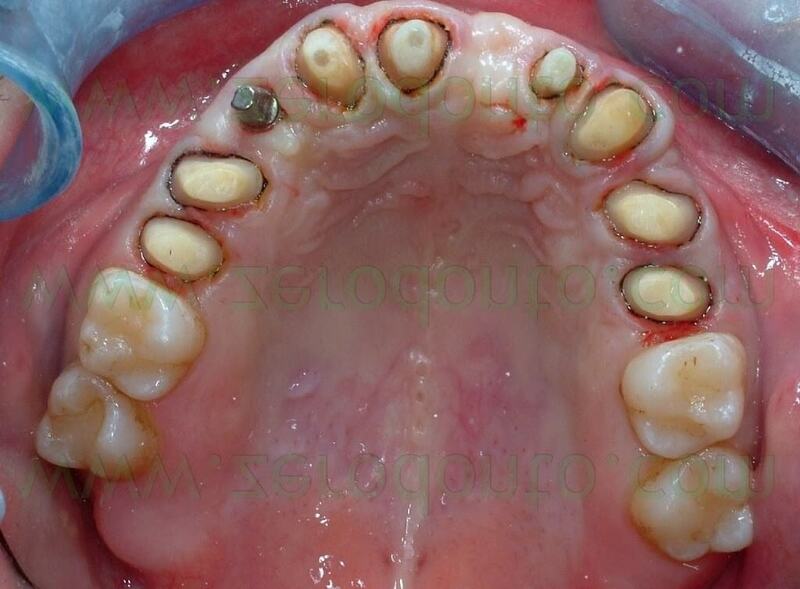 And the least traumatic avulsion was performed, in order to preserve as much as possible the residual alveolar bone, having planned the placement of a delayed post-extraction implant. 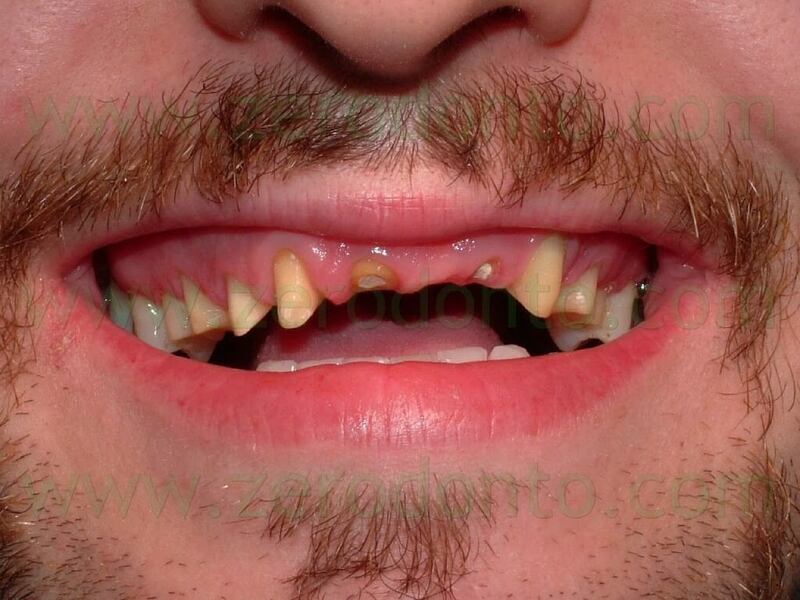 At the end of the surgery was finished teeth preparation in order to adapt the provisional. 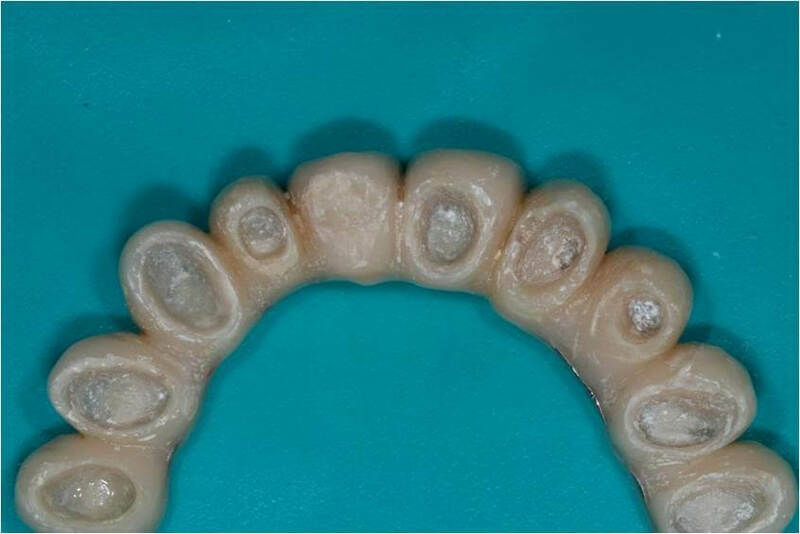 An intraoral relining was accomplished with self-curing acrylic resin, with extreme caution in maintaining surgical margins free of residual resin and polishing the prosthesis closure edges to reduce the risk of plaque retention. 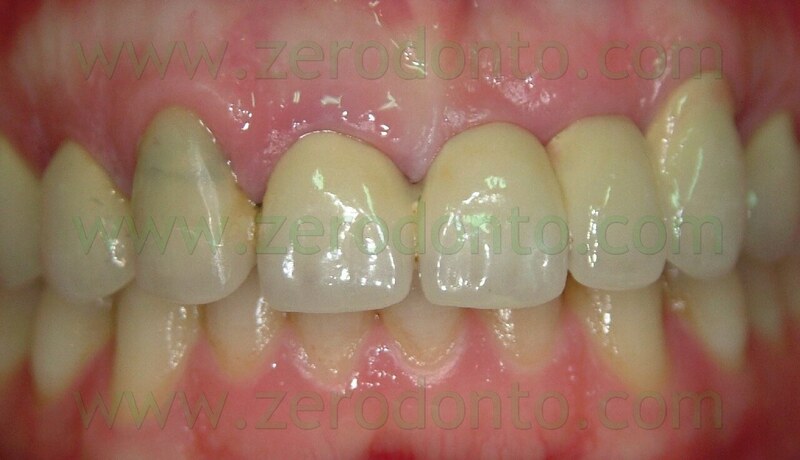 Then were made the endodontic retreatment of teeth 11, 13 and 22 and the abutments were reconstructed using glass fiber posts and loaded composite resins. After preparing the abutments was made the provisional relining. 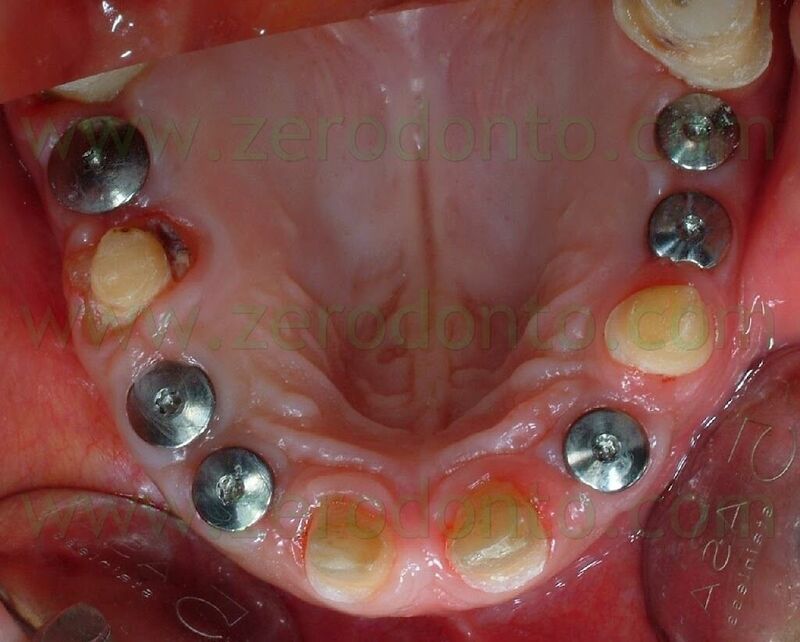 Six weeks after the apical resetting of the flap, was inserted the delayed post-extractive implant in region 53 and a connective graft to restore the vestibular convexity of 21. 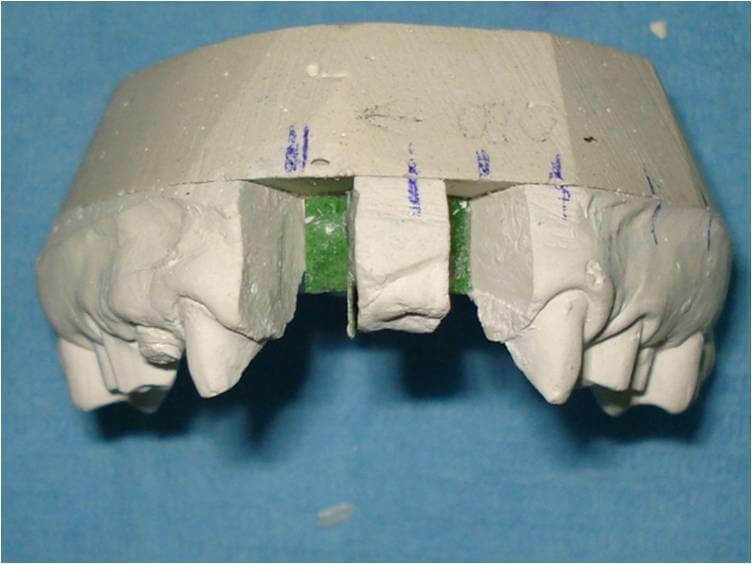 The abutment in position 22 was more lingualized than the remaining prosthesis elements. 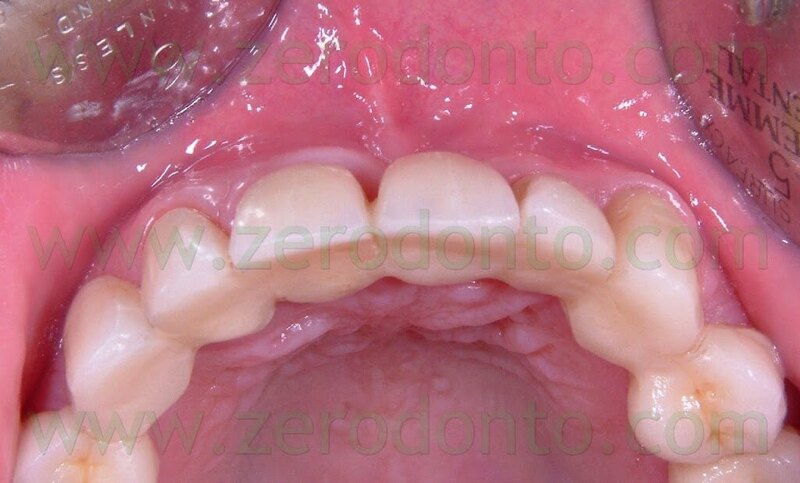 To realize a restoration collinear with the other crowns in the buccal-palatal direction without making an orthodontic movement of the abutment 22 would have to create a buccal ceramic surplomb. 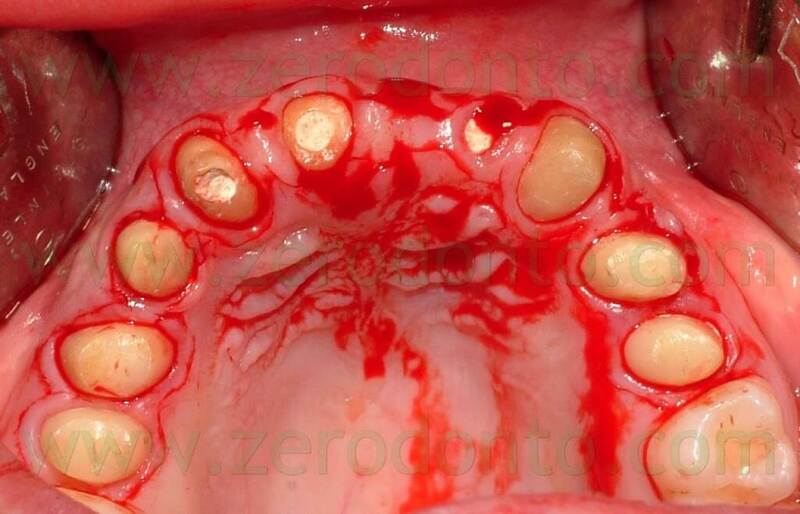 This would have created a difficult to clean area with an increased risk of suffering periodontal disease, as well as a clear anaesthetic area. 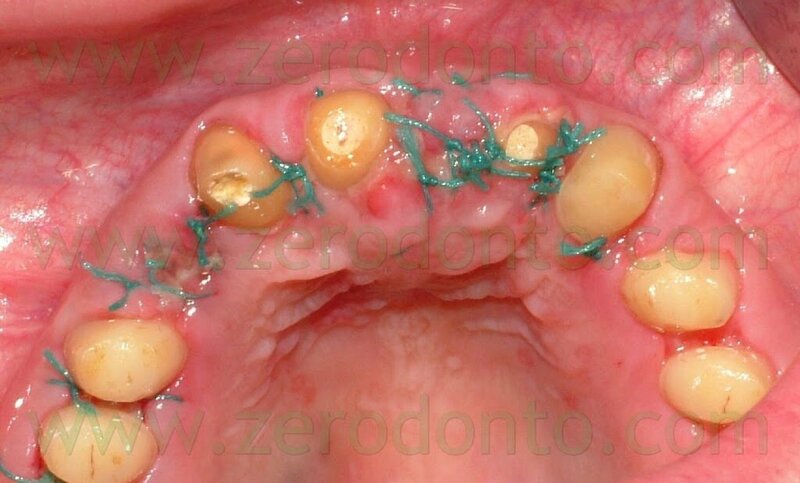 Consequently, it was necessary the orthodontic alignment of the support moving buccally tooth 22. 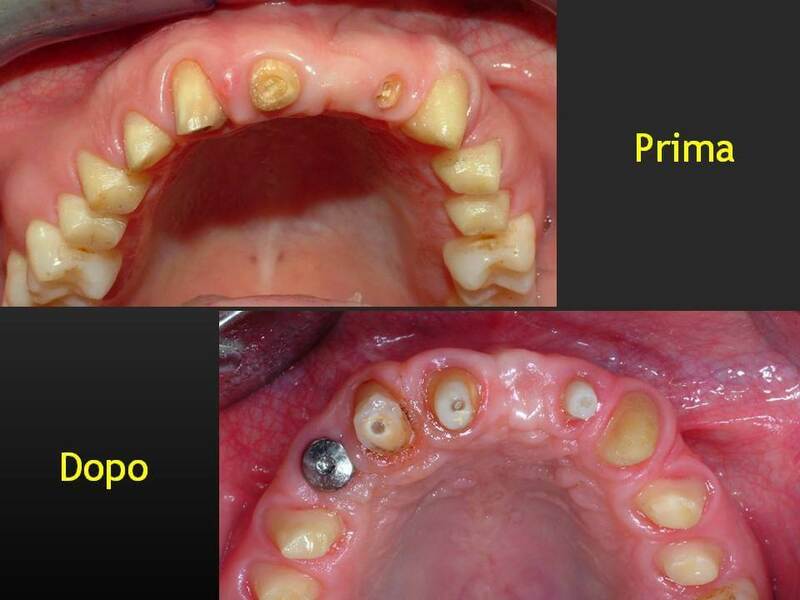 A traditional orthodontic approach would require the construction of a single temporary crown on tooth 22 and the bonding of buccal or lingual brackets. 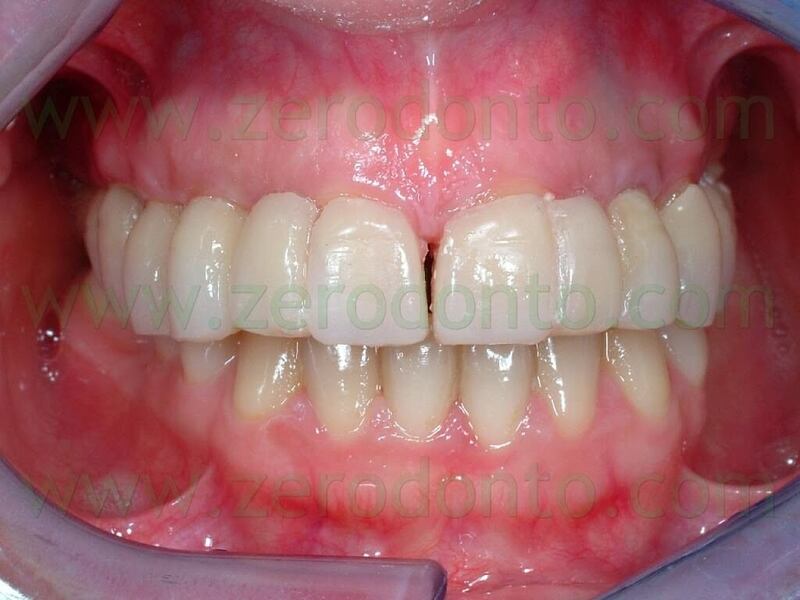 However, the patient expressly requested an invisible therapy without the traditional orthodontic bulky appliances. 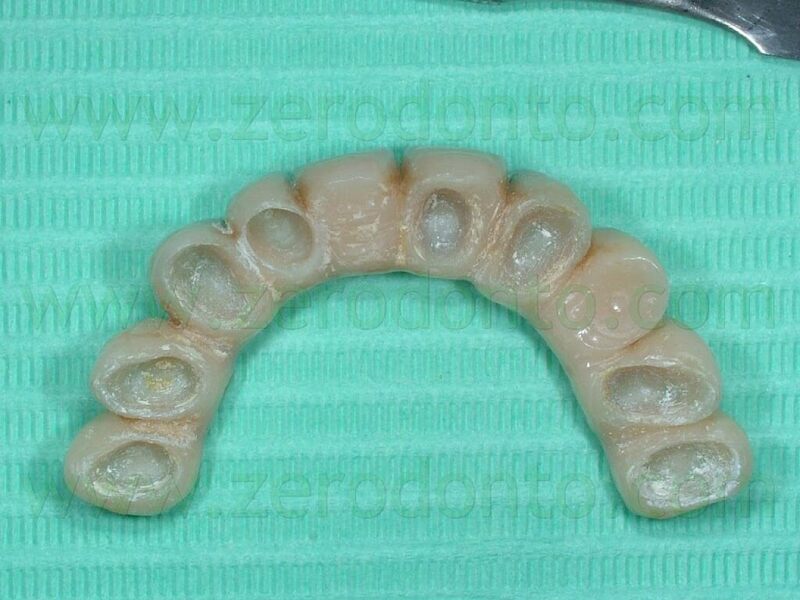 It was designed, therefore, to move the abutment using only a provisional resin crown modified with resilient material. 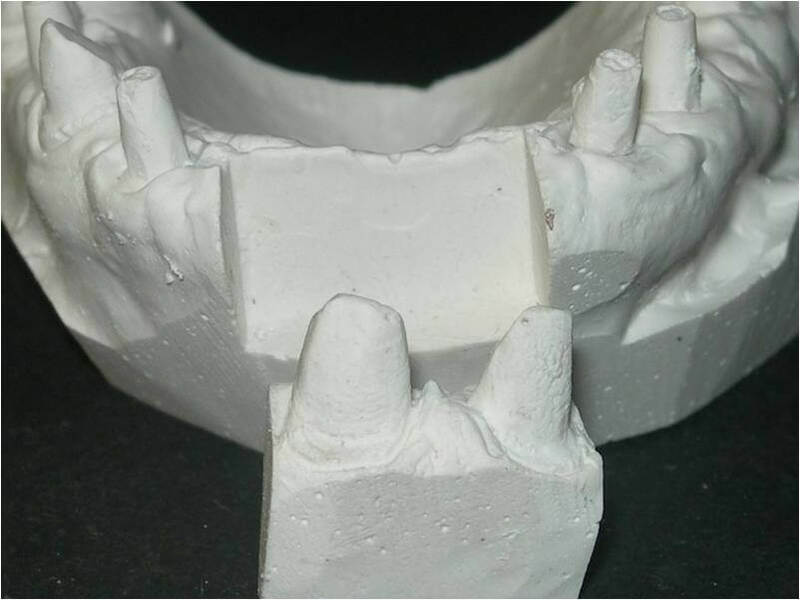 This innovative approach had developed from the experience with orthodontic therapy with thermoformed aligners and involves the production of controlled movements to move the abutments on the model cast. 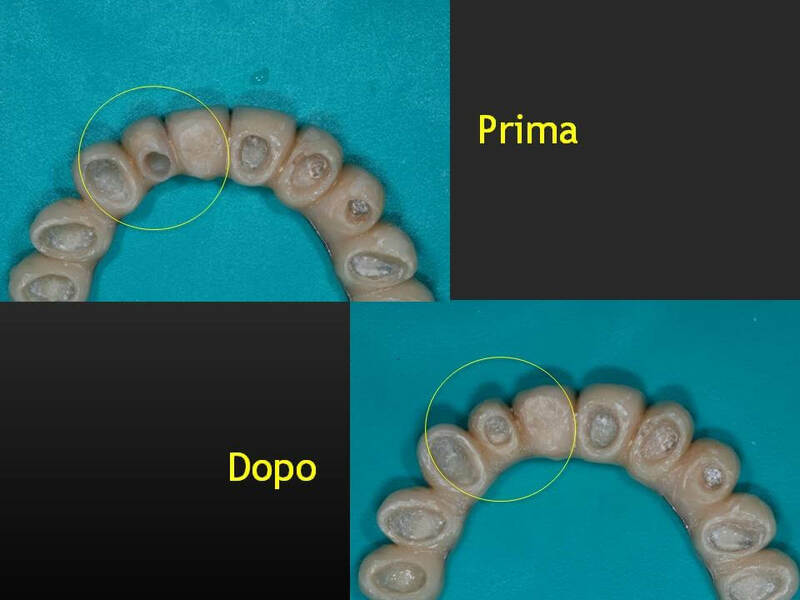 The ideal position should be studied by means of a diagnostic wax-up. Subsequently, many duplicates of the working model are created as the number of steps required to achieve the desired movement. 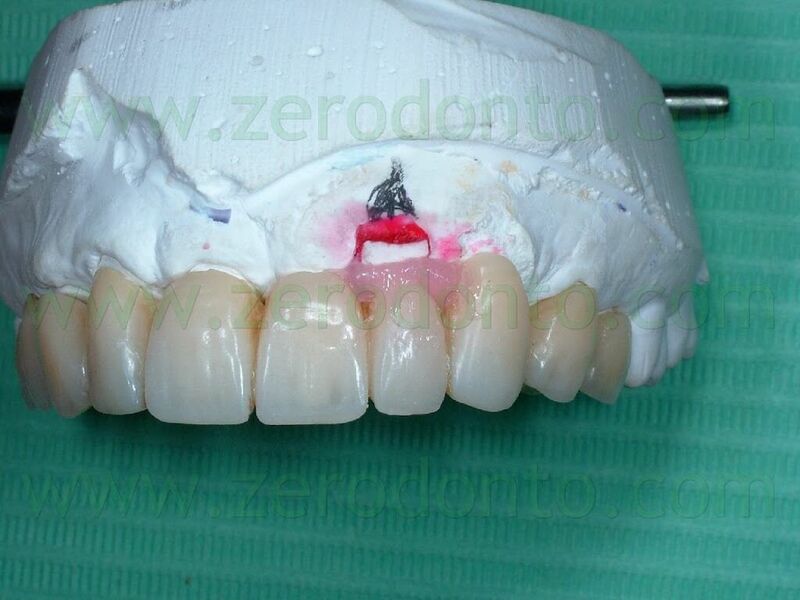 On each duplicate a set-up is accomplished with an abutment shift to the new position 0.3 mm higher than the previous. Such movements are calibrated using known thickness card stocks. 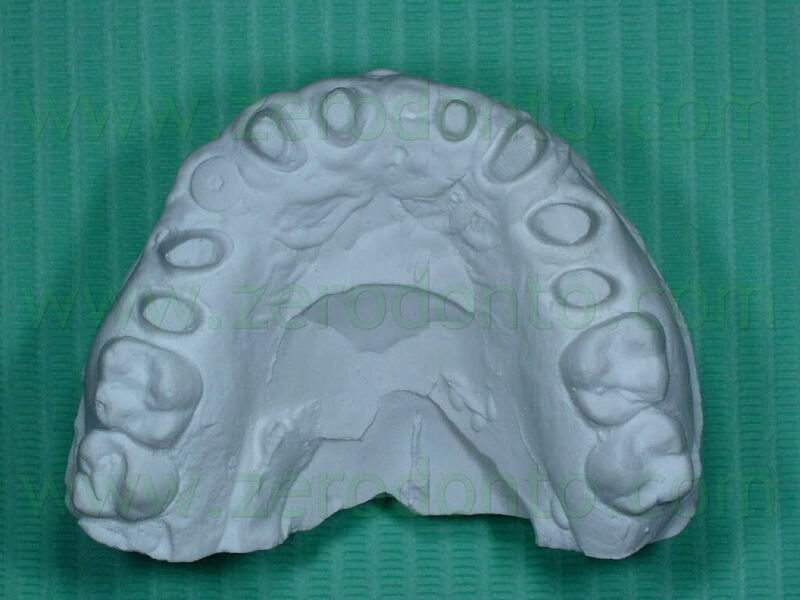 A precision impression of the upper arch was token with an addition silicone and the dental laboratory has developed a working model with a removable abutment in tooth 22 region. 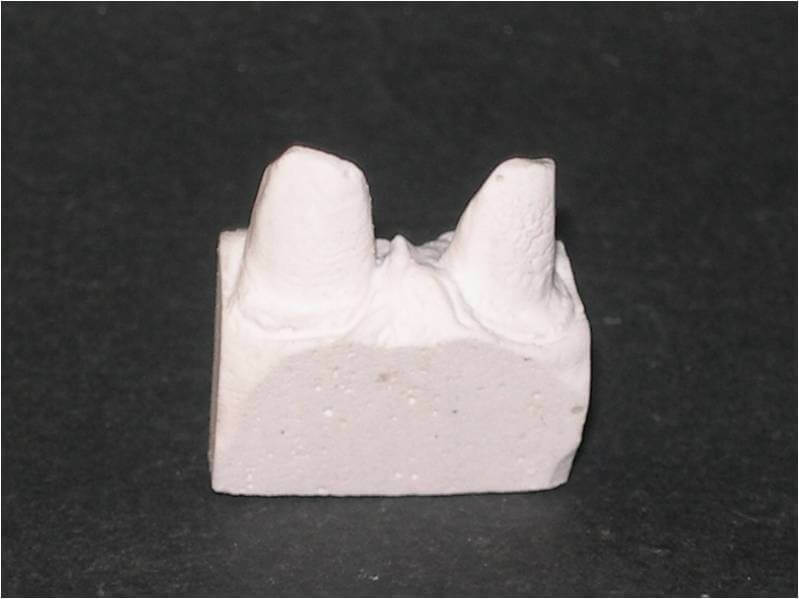 At first was poured in gypsum only the abutment 22 area of the impression, with the vestibular portion of the supporting tissues, after which the abutment base was isolated with vaseline and the rest of the model was poured. 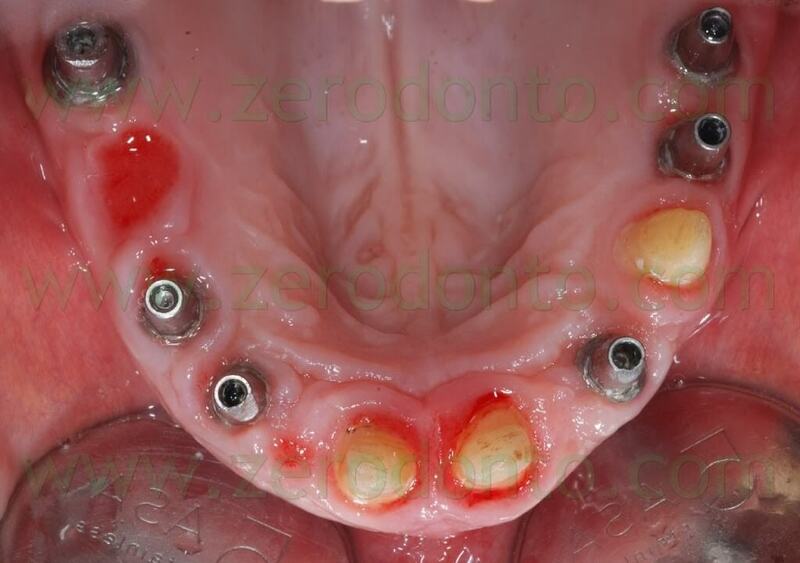 In this way, we obtained a removable abutment that could be moved buccally. 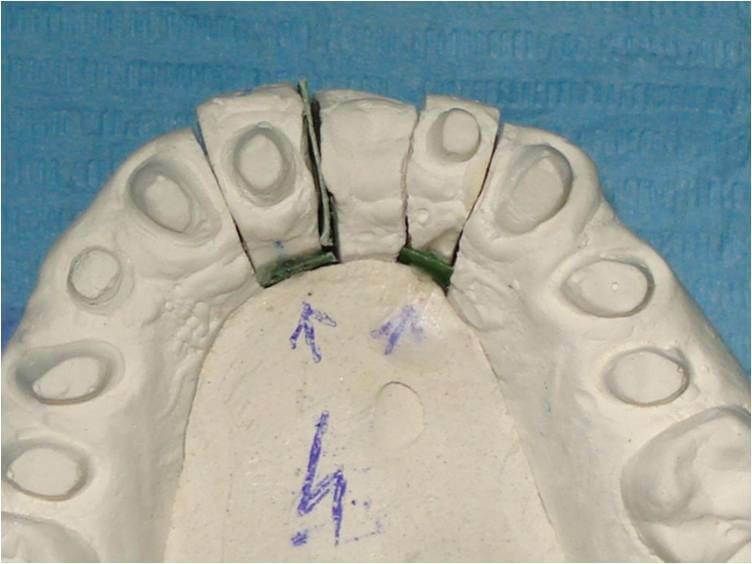 The setup of the desired movement was achieved by the palatal interposition on the removable abutment of 0,3 mm thick card stock, to control the abutment movement. 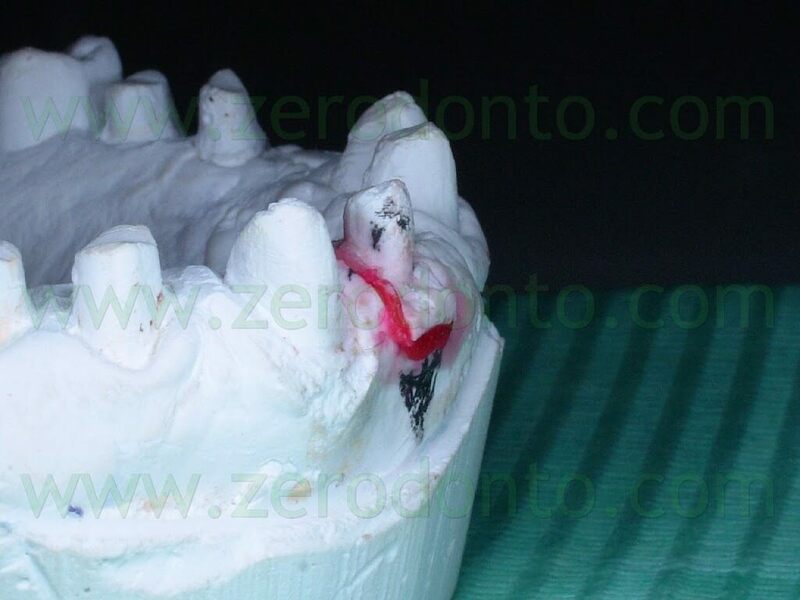 As described above, the model cast has been duplicated many times as the necessary steps to achieve the desired position, in order to realize the next setups. 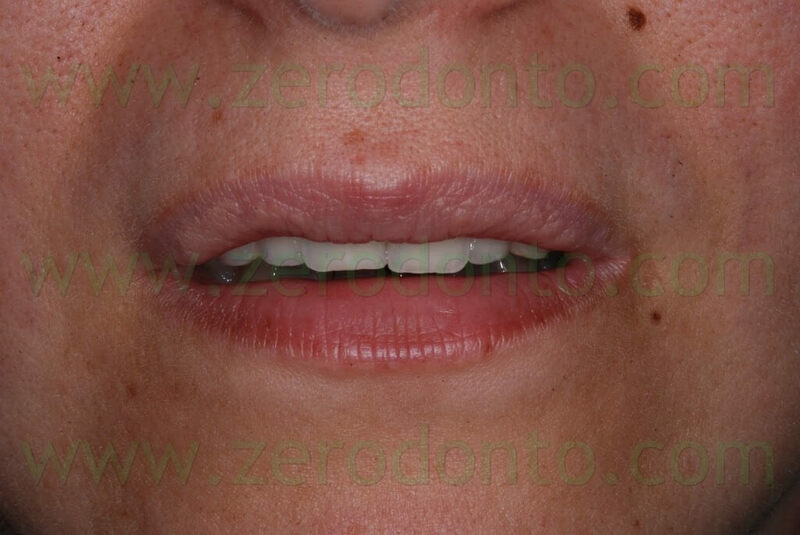 In this case were performed 8 movements, for a total buccal displacement of 2.4 mm. 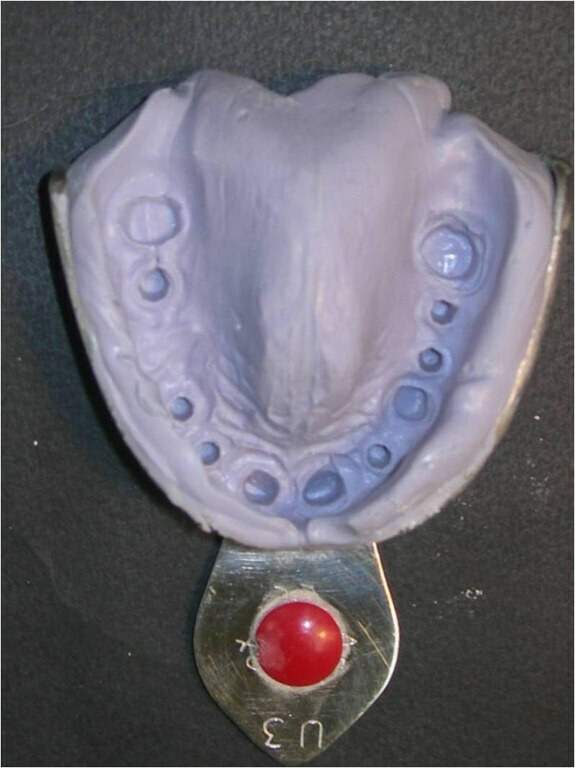 On the base of this model setup the provisional crown was removed during each appointment, cleaning the old cement out of the crown and removing the resin surrounding the abutment 22 and adapted to the next setup with a resilient silicone that would provide light orthodontic force in order to obtain the desired movement. 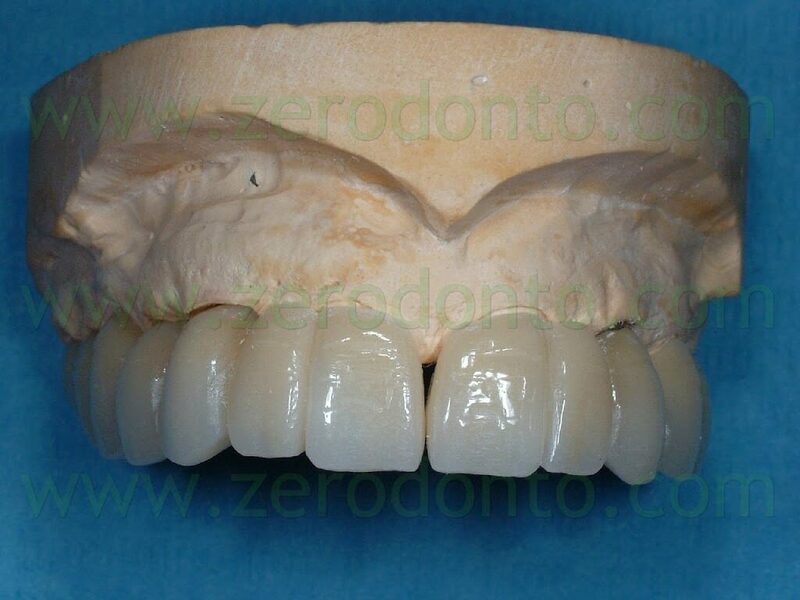 A relining silicone for removable dentures was used because of its high elasticity. 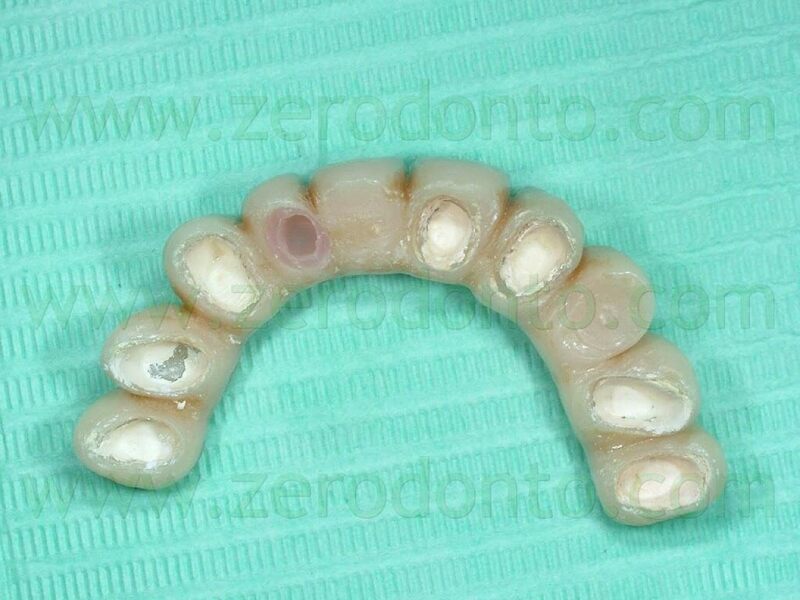 In the next steps was always removed in slight excess the resin so that the resilient silicon could surround the entire abutment periphery. After relining and finishing were completed, the modified provisional was fixed with temporary cement except from the abutment we wanted to move. 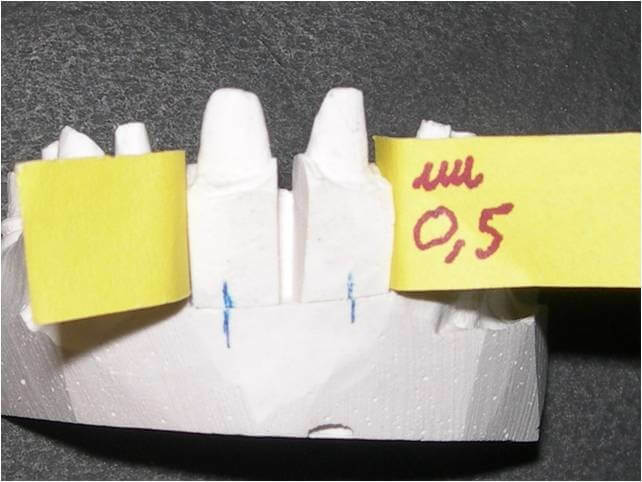 The small discrepancy of position (0.3 mm) between the intraoral abutment and the setup abutment developed a light force that moved buccally the abutment. 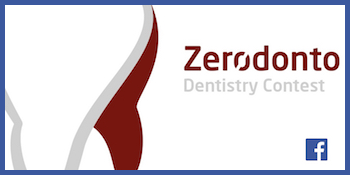 The patient felt a mild tension for a few hours, comparable to that reported by patients undergoing conventional orthodontic treatment. 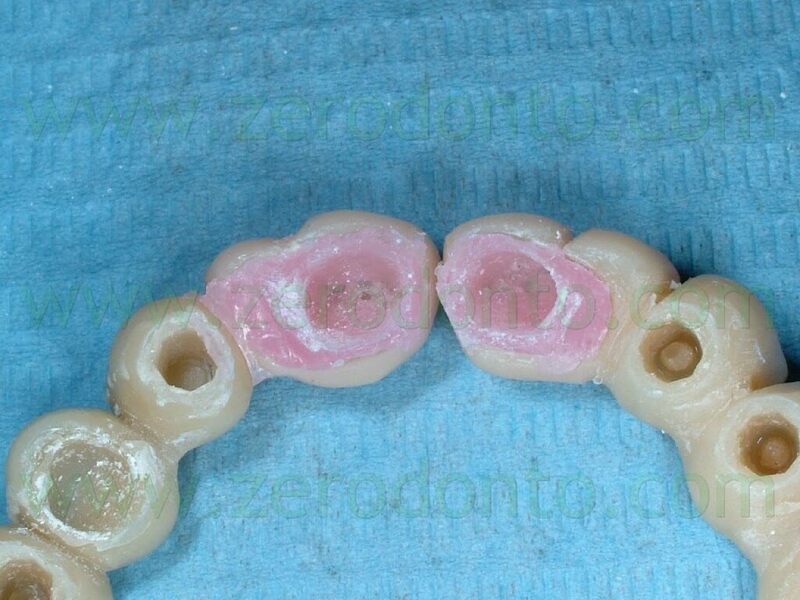 Every two weeks, the provisional was modified according to the next setup, until it reached the final position previously established with the diagnostic wax-up. 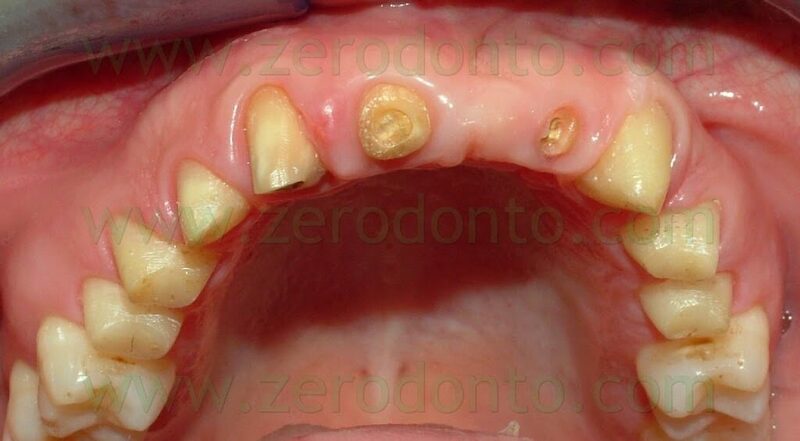 Considering the buccal abutment movement necessary to achieve a correct prosthetic position not be detected reliably by a simple intraoral radiography, the management of this first case has not allowed us to see if the tooth movement was of the entire body or only of the crown. 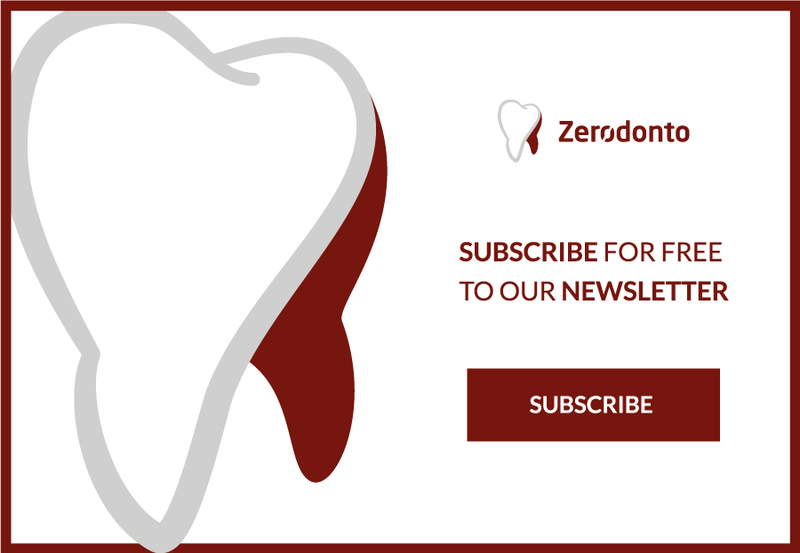 The authors believe, however, that the shift has involved only the tooth crown, as, among other things, it often happens with the aesthetic orthodontic treatment which has been mentioned previously. 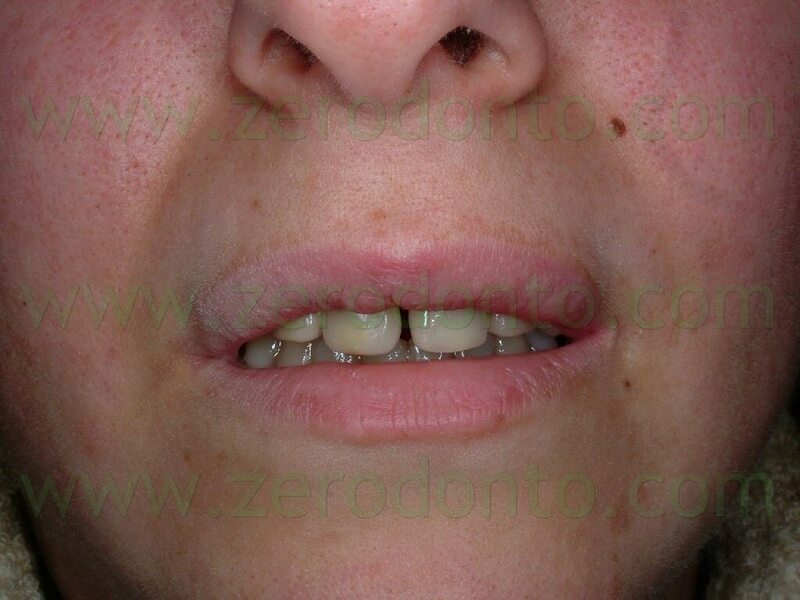 A female patient 32 years old came to our observation, who had lost over the years several dental elements for periodontal reasons, and had a full-arch fixed partial prosthesis in the upper arch separated in the midline. The prosthetic therapy appeared incongruous both functionally and aesthetically. 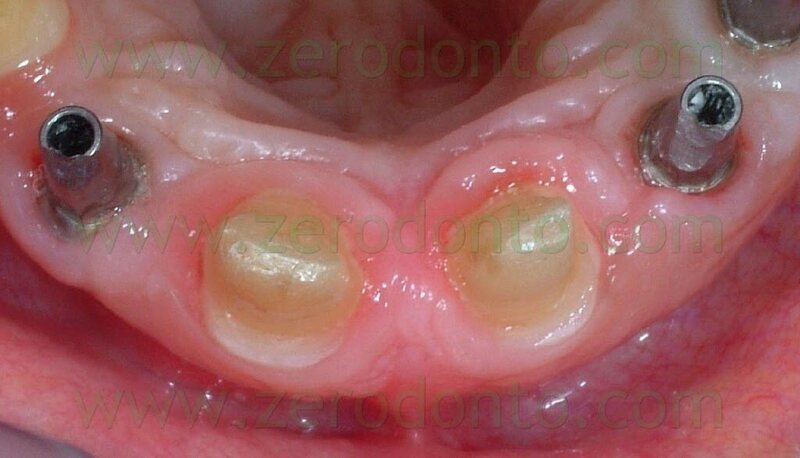 Three periodontally compromised molars were treated with root planing and maintained in the arch in the first phase of treatment in order to provide retention for the provisional restoration. 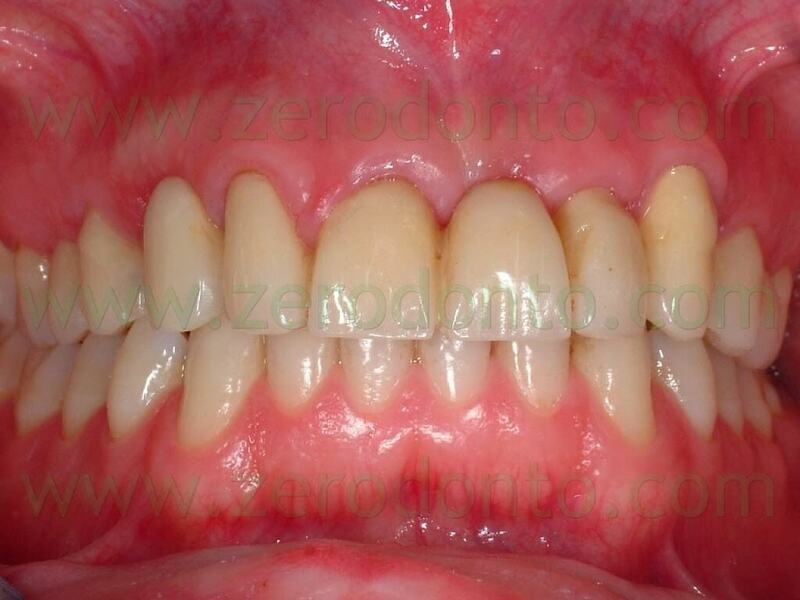 After the causal periodontal treatment, 6 not submerged implants were placed in the dental gaps remaining. 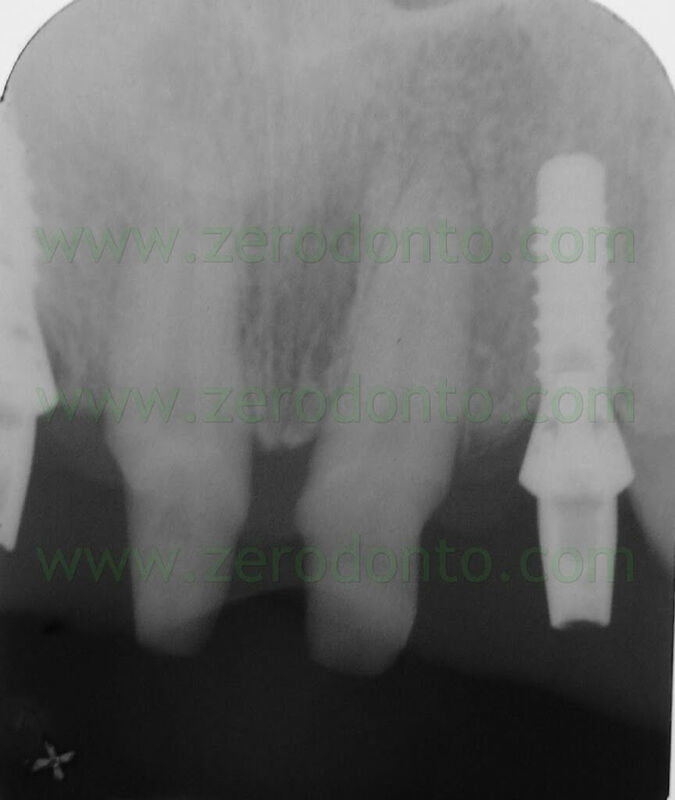 The implants were inserted using a surgical template constructed on the basis of a diagnostic wax-up approved by the patient, that provided the shift toward the midline of the two central incisors and closure of diastema of about 4 mm. 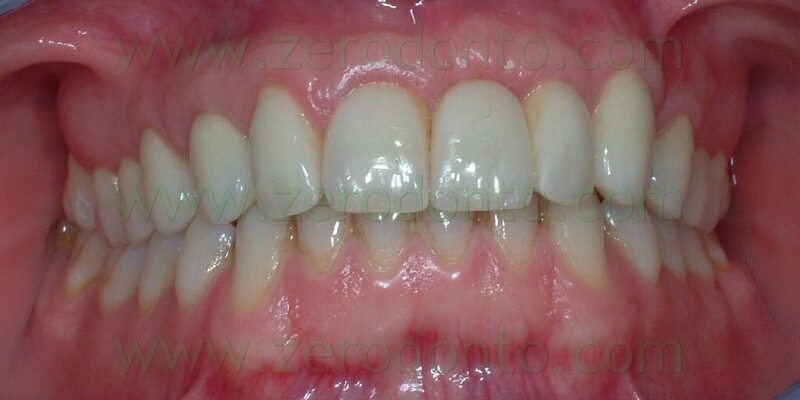 The patient refused the diagnostic wax-up without the central incisors shift. 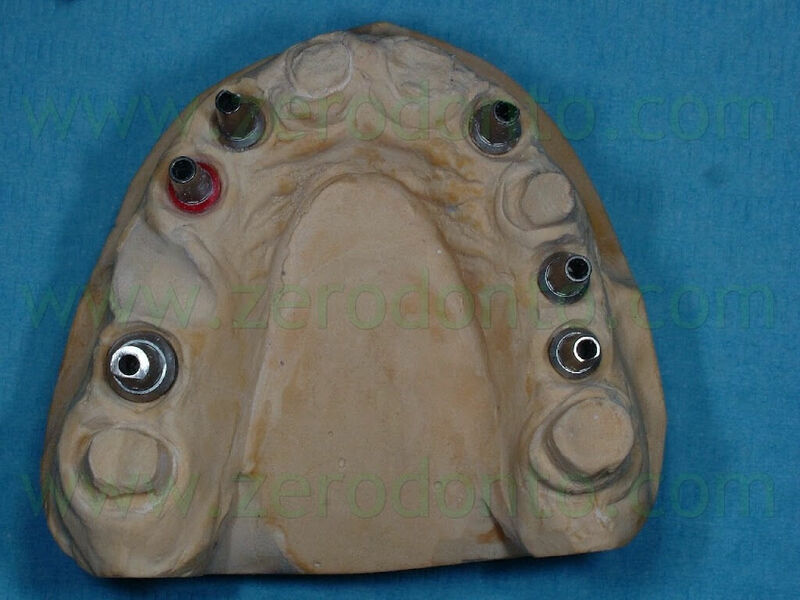 A precision impression of the upper arch was token with an addition silicon and the dental laboratory developed a working model with two removable abutments in region 11 and 21. The performed procedures were similar to those described in Case 1. 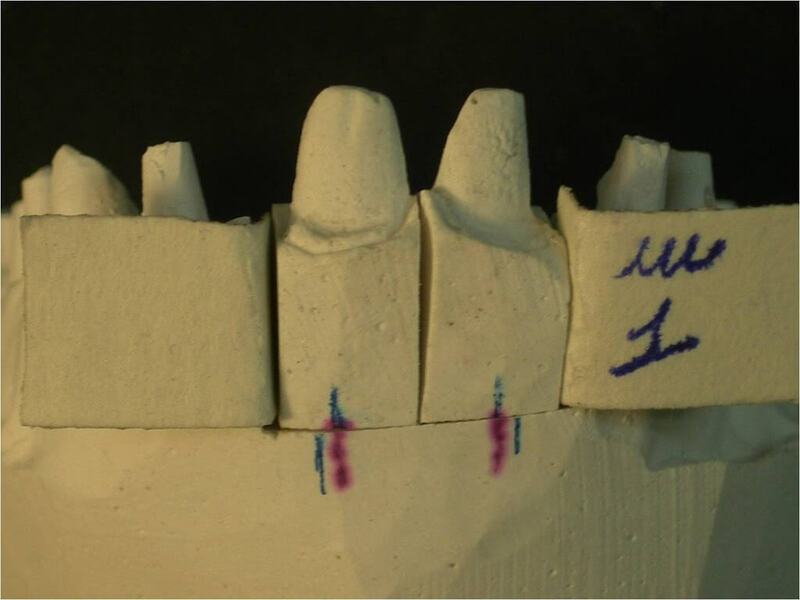 The abutments of the central incisors were separated along the midline and the orthodontic setup was carried out placing calibrated thickness cards of 0.25 mm, distal to each incisors to obtain a reciprocal mesial movement to close the inter-incisal diastema. 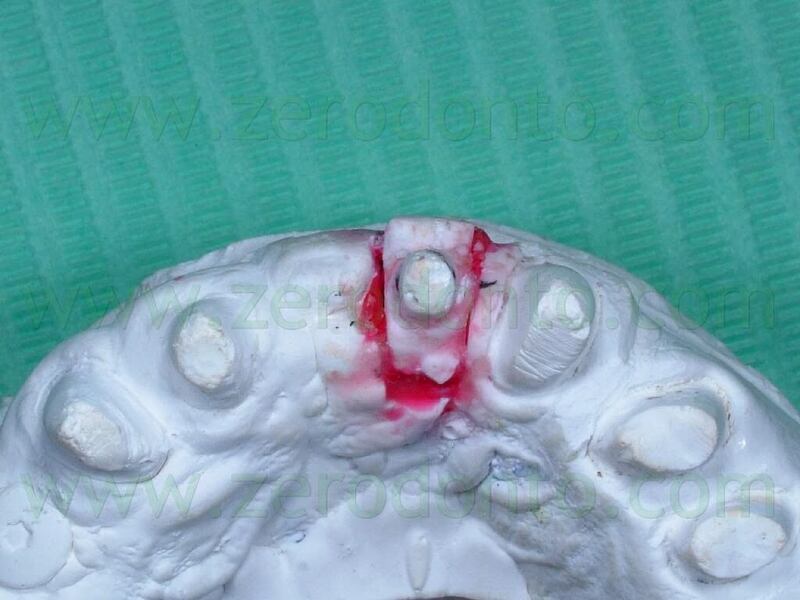 As described above, were made 8 setups, to a total displacement of 4 mm (2 mm for each abutment). 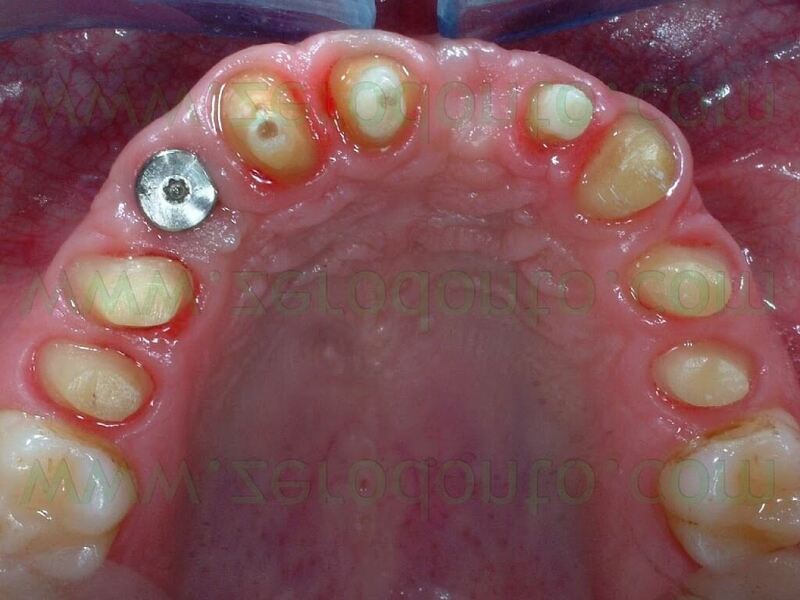 Similarly to what reported in Case 1, the temporary was removed during each appointment cleaning the old cement out of the crown and adapted to the next setup with a resilient silicone that would provide light orthodontic force in order to obtain the desired movement. 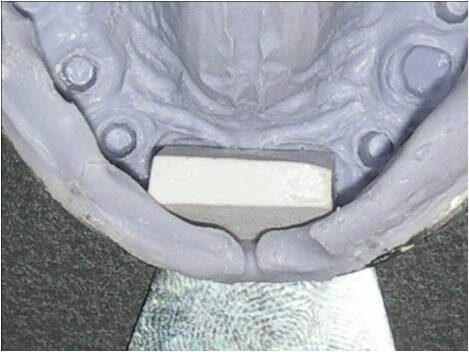 A relining silicone for removable dentures was used as described above. 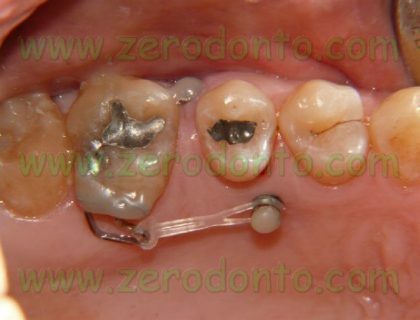 It was always removed in slight excess the resin so that the resilient silicon could surround the entire abutment periphery. After relining and finishing were completed, the modified provisional was fixed with temporary cement except from the abutments we wanted to move. 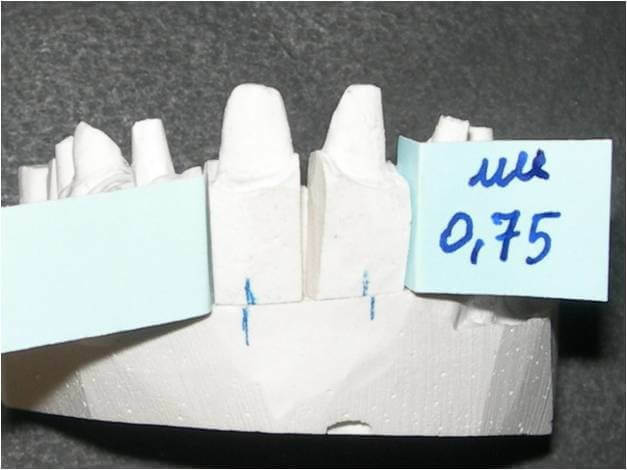 The small discrepancy of position (0.25 mm) between the intraoral abutment and the setup abutment developed a light force that moved buccally the abutment. 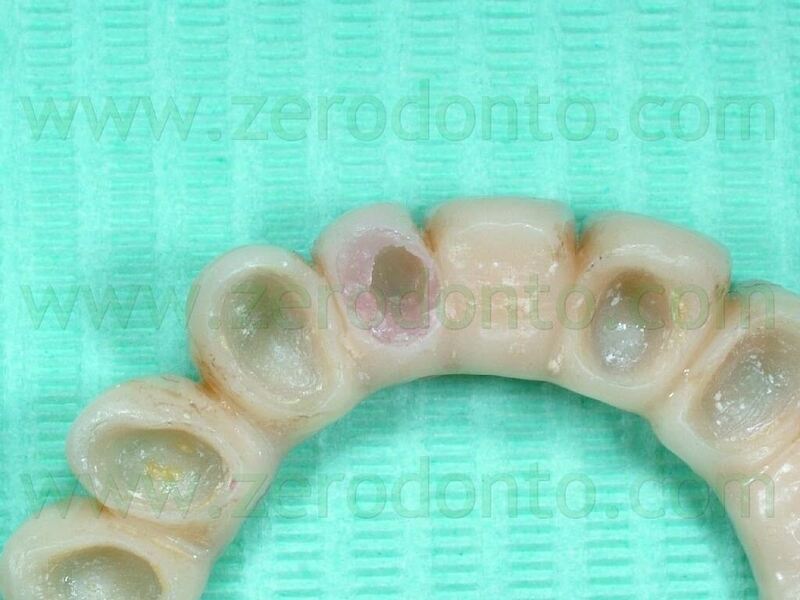 Every two weeks, the provisional was modified according to the next setup, until it reached the final position previously established with the diagnostic wax-up. 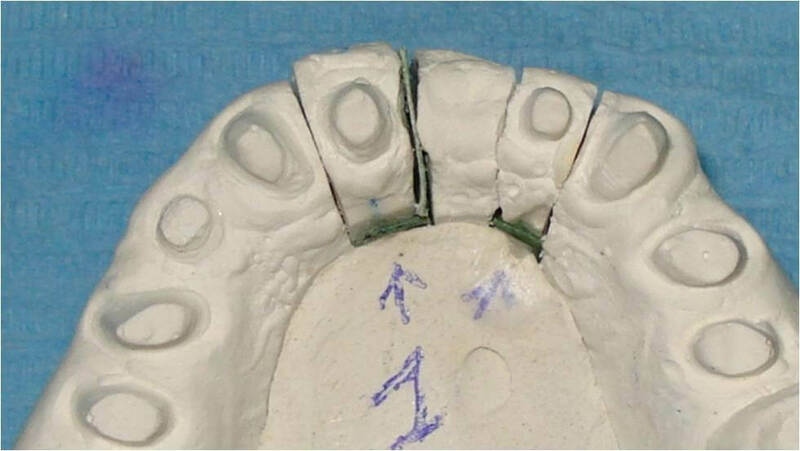 For the first four weeks, the provisional was divided at the midline, then, it has been joined in this area through self-curing resin, to exert a mutual slightly higher force. 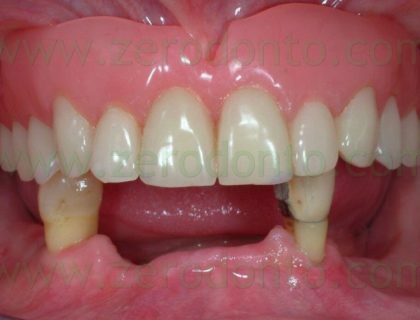 In the early stages where it was kept separate on the median, in fact, in the early hours after cementation it showed a small diastema generated by the tension exerted by abutments on the same provisional. 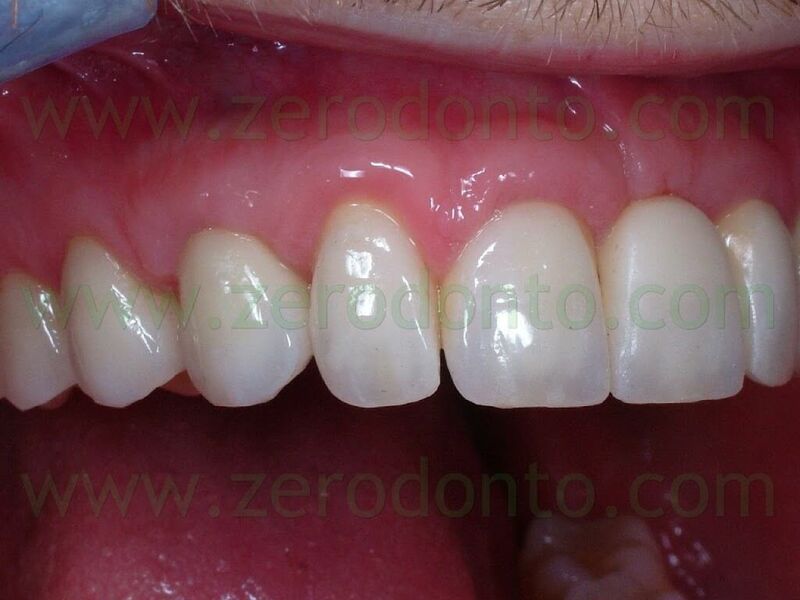 After about three months was obtained mesial displacement of the two abutments of about 4 mm. 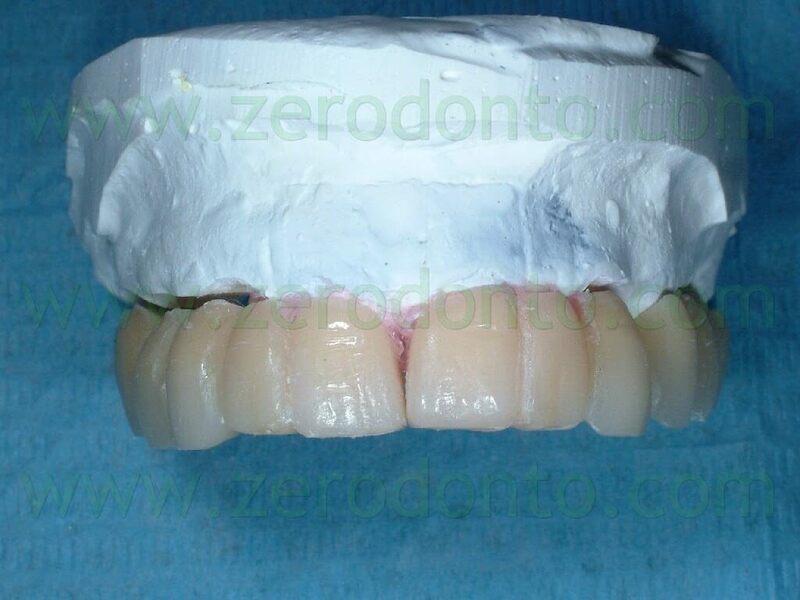 The definitive prosthesis was finalized with zirconia-ceramic structures. 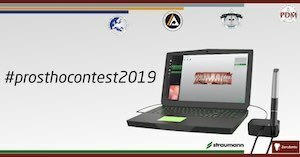 The mesial abutments movement necessary to achieve a correct prosthetic position was follow up with standardized simple intra oral radiographs and it has been highlighted only a coronal movement as it often happens with the aesthetic orthodontic treatment previously mentioned. 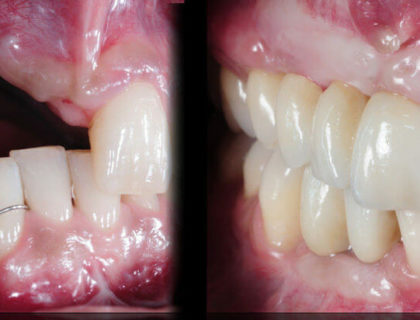 The proposed innovative technique can provide a great help if you need to get an orthodontic movement of teeth abutments easily and limiting the patient discomfort, without the traditional orthodontic bulky appliances. 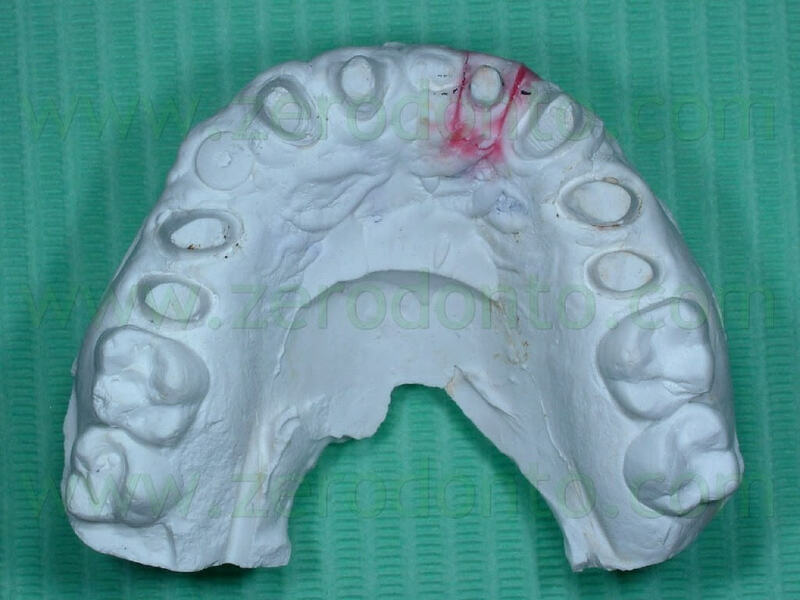 Differently from the conventional orthodontic brackets therapy it will be not necessary individual provisional prosthetic components, that are difficult to realize in the absence of the adjacent teeth. 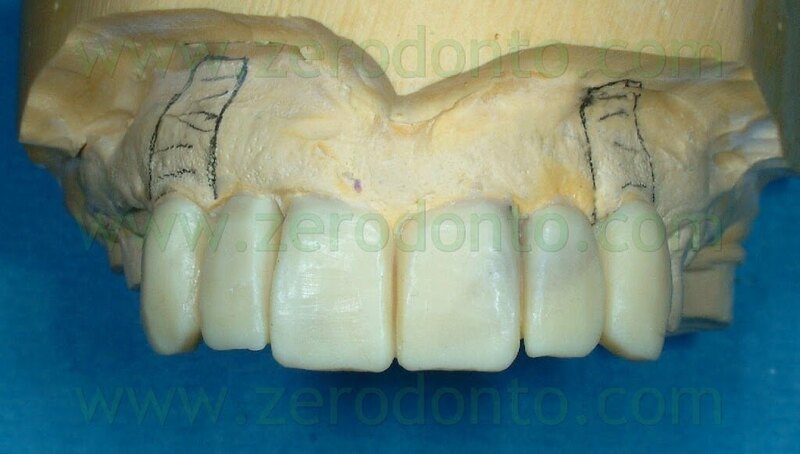 However, like any orthodontic movement, it needs a good anchorage to achieve a reasonable and controlled movement; we suggest therefore to use the described technique only with long-span prostheses or when there is also an implant support. 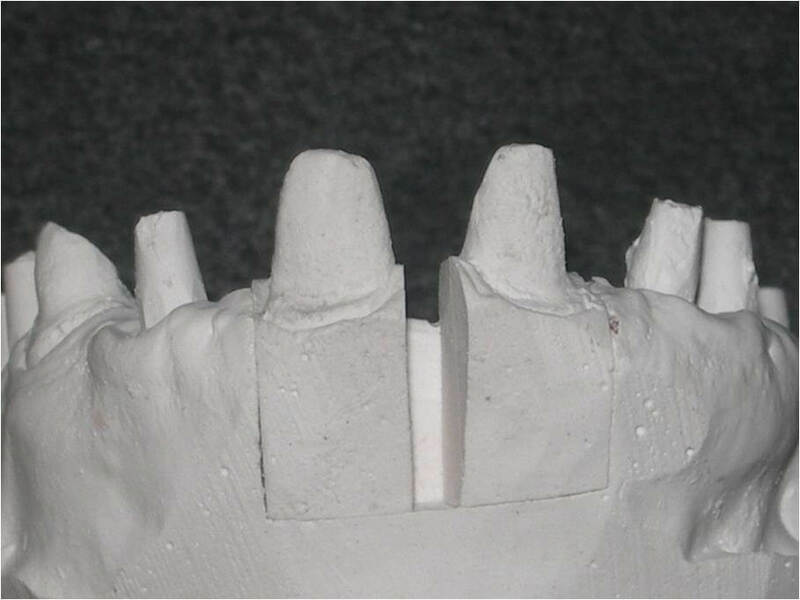 According to authors the management of the described technique proved simple and rapid execution, solving functional and aesthetic problems with a minimally invasive approach and without compromises. 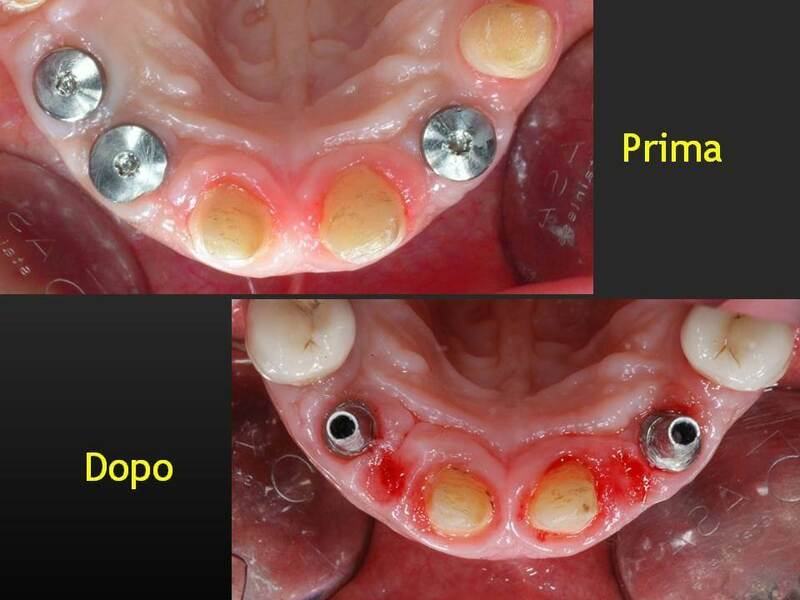 The method could be particular interesting in case of residual rhizotomized roots to optimize the abutment position. 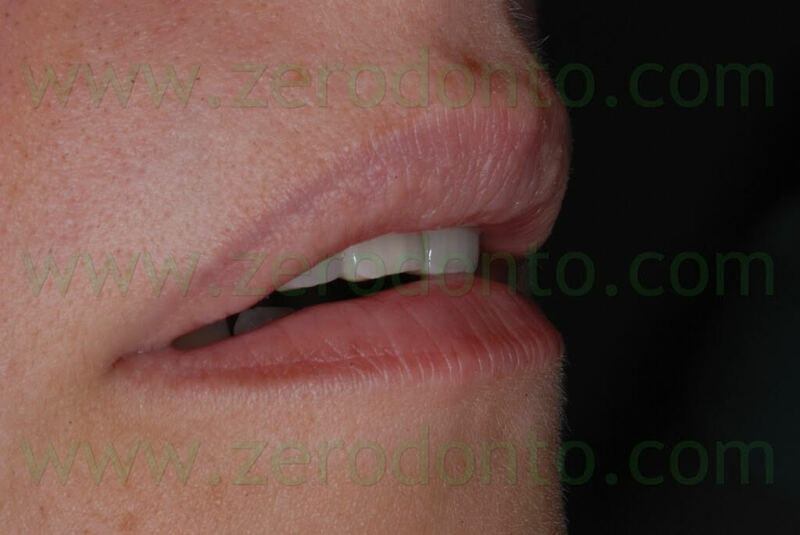 There weren’t clinical problems about movement direction, being able to realize easy both buccal-palatal and disto-mesial movement. 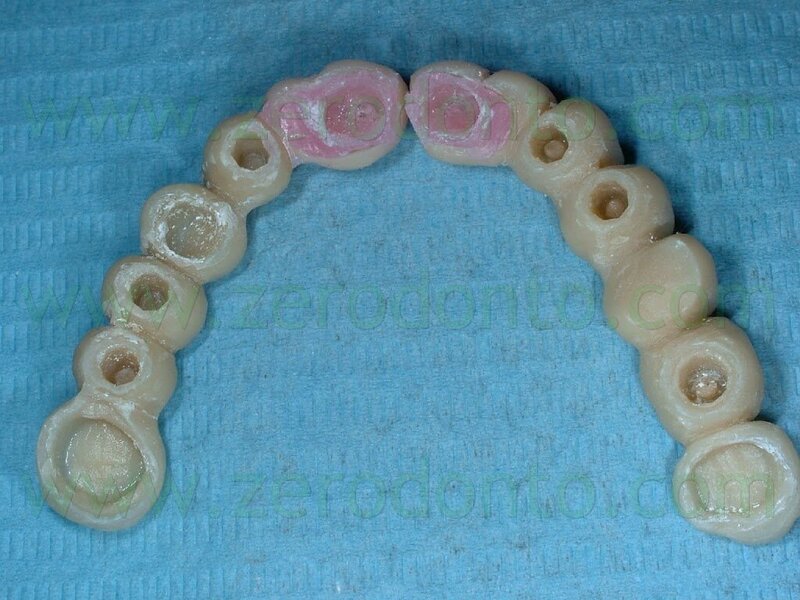 On the other end intrusive or extrusive movements, using resin buttons on the abutments, have been tried without success or with minimal results. According to the authors opinion, based on limited clinical experience with these procedures, the technique needs to be improved, both clinically, in terms of follow-up, and biomechanically. It can open interesting development prospects especially within the prosthesis field. The validation of the obtained biomechanical movements was carried out using in vitro models with gauges.